The good news is that so far the oil has still not landed on the shores of Florida. Prayers continue that our shores be spared. The bad news is the oil is still flowing. It has been a pretty busy week. We delivered the polo shirts to our new customer Flora-Bama Farms. If you live in this area, please visit Flora-Bama Farms are 6404 Mobile Hwy. It’s a fresh fruit and vegetable market and they have some pretty good deals. They carry a lot of the Amish foods, as well. The prices are very reasonable. You are buying local. It’s a win-win situation. Not to mention they love our embroidery and are thinking about ball caps and aprons. The neighborhood gang has not gotten together since the going away party. I’m thinking that we need to remedy this situation soon. The lettuce and other cold weather crops have pretty much been harvested and are gone. So, sad to see that gone but our tomatoes are growing. Each year we have success with the little cherry tomatoes but not the larger tomato. This year George purchased several Better Boy seedlings, instead of starting from seed, and they seem to be working. The tomatoes are still green but if they all turn red, we are going to have a bounty for sure. We also, of course, have the little cherry tomatoes planted. The bell peppers are just about ready to pick. They are green. We have a few that are a pickable size. If we leave them on the plant, they will turn yellow and then red. It looks like bell peppers are going to be a winner this year, too. We still have some carrots and onions in the garden. The parsley is going to seed. The stevia is back and lush. The lemon balm grows everywhere. That is one amazing plant. We had to pull it out of the herb garden (we never planted it there in the first place) and in the process, the mint came out, too. I’m hoping the mint comes back. George planted some eggplant but just a few. The first year we planted eggplant we had so much I couldn’t give it all away. Of course, now maybe Flora-Bama Farms will take it. Green beans are still growing. I made one blackberry cobbler this year. We had more blackberries in our little area but after the first harvest, there was never enough at one time to make another cobbler. We were both so impressed at the working with nature aspect of the blackberries that we are going to section off a larger plot that we will weed and allow the blackberries to grow. The jasmine is just about finished blooming. That plant has such a wonderful smell. I hope it just covers the entire fence. Speaking of a wonderful smell, the gardenia bushes have been looking pretty sad for the past few years. We think it has to do with them being in a shaded area. George cut them down, almost to the ground. I noticed yesterday that one lone gardenia is blooming from a tiny branch almost on the ground. We have another small gardenia bush that George grew from a clipping that is also blossoming now. Another fabulous smell for our yard. The lilies are spectacular this year. I took pictures of some of them and posted on Facebook and put more pictures earlier this week on the blog. Some of the lilies smell and others do not. We planted a little flower garden outside of Mama’s room when she moved in. I wanted her to be able to see beautiful flowers when she awoke in the mornings. That room is now the Cajun Stitchery embroidery room. There is a beautiful blue hydrangea in bloom right now. She would be so pleased. She loved hydrangeas. With the flowers and plants come the birds. The birds have also been spectacular this spring. The red tailed hawks are not nesting in their usual oak tree. We have had a plethora of cardinals, as well as an array of other species. It’s like they all decided to move into a bird paradise. They drink out of the solar waterfall. They bath in the sprinklers, they eat in the garden. That’s the life. My cats just sit in the window all day staring at the birds, with an occasional meow. We had many baby grapes on the vine this year. We still have a lot but are noticing that as the grapes are getting bigger, the grapes on the clusters are thinning and we are thinking the birds are enjoying our grapes. Last year George and I were able to enjoy one little bunch of grapes from our vine. I hope the birds leave enough for us this year. I haven’t made any more cell phone holders. It took days to put the ones I did make on Etsy because I didn’t want to “flood the market” with all of the cell phone holders in one day. We have had a lot of visitors to the store, looking and browsing. Etsy remains a classroom for me in retail. I’m learning a lot. We had another order for a couple of tee shirts for my Aunt Philo’s bowling team. Seems a couple of gentlemen have decided to join and, of course, needed their own team shirt. You know my aunt is now 92 years old, deaf, has compromised vision and bowls. I am so proud of her. The really big news this week has been ball caps. YES! The cap sash issue has been conquered. George can put that cap sash on easily. He hooped our first cap and stitched out our Cajun Stitchery logo without a problem. I’ve been wearing that cap all week. We ordered several “practice” ball caps and we are working on all of it. There will still be a learning curve until we get it down perfectly. Part of that curve is in the digitizing. We already have some orders. I digitized the requested design and it stitched out fine on flat fabric but messed up on the cap frame. Who knew? Digitizing for caps requires some special techniques. I’m learning. I never knew there was a whole lingo for hats and caps. There are structured and unstructured, different size crowns, different size bills, different fabric requires different techniques. We have read instructions and watched videos until I think we are embroidering caps in our sleep. Several months ago a friend gave us a “ponytail” cap and asked us to learn to embroider on ball caps. The ponytail cap has an opening in the back larger than usual to accommodate ponytails. I looked up the company on the tag and found a really good cap company. This week I send the required documentation to allow Cajun Stitchery to purchase wholesale from this company. To try them out, we ordered two dozen patriotic visors. The prices are good. We ordered the visors delivered UPS ground. The visors arrived yesterday – one day delivery. So far, I’m very impressed with this company. The patriotic visors are our sale of the week. See below. The pretty young schoolteacher was concerned about one of her eleven year old students, "Tee" Boo. Taking him aside after class one day, she asked, " 'Tee', why has your schoolwork been so poor lately?" " Mais, I can't concentrate, Teacher !" replied :"Tee". "I done fell in love." "Oh, is that so?" said the teacher, holding back an urge to smile. "And with whom?" "Mais, wid you," he answered. "But 'Tee'," exclaimed the secretly pleased young lady, "don't you see how silly that is? It's true that I would like a husband of my own someday; but I don't want a child." "Oh, don't worry, Teacher" said "Tee" reassuringly, "I'll be careful." Use the bus or train instead of flying. Travel with a group. These packages can be found with any travel agent. Find a eco-friendly hotel before leaving. Reuse towels while in the hotel. When leaving the hotel turn off air conditioner if no one will be in the room. Walk around the town or use public transportation. If on a group package, they will have a bus for you to travel on while site seeing. Eat from the local menu. WE CAN EMBROIDER ON BALL CAPS SALE!!!! We have one dozen of each of the patriotic visor styles in the photographs. This sale is for these 2 dozen visors. First come, first serve. The visor with the red, white, blue, and yellow bill has a red band. Sale: one patriotic visor without embroidery is $5.00 plus tax/shipping. We will be glad to embroider on the band, upon request. Don't Miss The We Can Embroider On Ball Caps Sale!!!!! It's Wednesday and time for another post. What has happened since Monday, our last post? Well, we completed the order for Flora-Bama Farms. I'm delivering these polo shirts tonight. I love those Cajun Stitchery tote bags. We have so much fun using all different colors on this logo. Yesterday we did some FSL (free standing lace) USA flag stars. They are so simple, yet so sweet. I think we will be making bunches of these. They are just fun. Reiko, the nail technician, loved her smock and says she is going to get more smocks and wants us to embroider her design on them. Yea. We have an order for two more VDL shirts. These are for my aunt's bowling team. We embroidered the shirts for the entire team last year. They are an amazing group of people and I surely do love them. Our dryer died. It's been making an awful sound for many months and we just never fixed it. Shame on us. Monday the horrible sound got even more horrible. George says it's the bearings. Luckily, we still had Mama's dryer in the garage. So, we have traded them out. Now George is going to try to fix the other dryer. I really liked my dryer because it has a large capacity and could easily dry a comforter. I want my dryer back, but it sure is a blessing that we had a standby dryer. We are really excited about being able to do ball caps. Many months ago, one of the Junkanoo ladies asked if we could embroider on ball caps. We knew Boudreaux had the capability but we kept putting off learning to use the cap sash. That is, until this past weekend. Anyway, the lady found some really cool ponytail caps. These caps are regular ball caps with a larger hole in the back to allow for ponytails. She gave us one and wants us to practice on it. She was elated this week when I told her that we can now do ball caps. However, we still haven't done her's because I'm working on the design. I'm trying to get that Junkanoo design small enough for the cap, yet still looking nice and crisp. In the meantime, I found the manufacturer of the ponytail caps and am pretty impressed with what I've seen. They strictly do ball caps. I sent them our resale information and we are now able to purchase from them. To try them out, we have ordered two dozen USA flag visors, 1 dozen of each of the visors shown in the pictures. These visors will not make it here by Memorial Day but July 4th is a bit more than a month away. We are celebrating our newly found ability to embroider on ball caps by having our WE CAN EMBROIDER ON BALL CAPS SALE. For as long as they last, these USA flag visors are on sale for only $5.00. Embroidery is extra. As with everything else there is sales tax and/or shipping fees. I have a feeling that these visors will go fast, so order them now, with or without embroidery. We will only have 24 when they get here. A couple of blogs ago I mentioned that we were working on using the cap sash. We did it. George has the cap sash down pat and installed on Boudreaux. We embroidered our first ball cap last night and it looks great. We need more practice but it wasn't as bad as others had told us. Once we get comfortable using, installing and uninstalling, this should be a piece of cake. We already have orders for ball caps. Now we have to get used to the ball cap lingo. There is structured and unstructured caps; low, medium and high crowns; a myriad of sizing closures in the back; twill, brushed twill, poplin, leather, and a bunch more fabrics; and, many other verbiages for ball caps. Not to mention that there are different companies who offer ball caps. We're familiar with the tee shirt companies, Anvil, Jerzee, Gildan and so forth. Now we have to familiarize ourselves with the ball cap companies. Who knew? Yes, I'm still playing with Etsy. Those little cell phone pouches are so easy to make and allow for so much creativity. I learned not to put everything on Etsy at one time. If I do that, they become a blur and don't stand out individually. If I put them on Etsy, one at a time, with a period of time between, then people get a better chance to see each one, and we get a larger audience. Etsy has several ways of "sharing" the items placed for sale. Facebook, of course, is top of the list; then Tweeter; Kaboodle; Tumblr; and, something else that I cannot remember. Facebook, I understand. Tweeter, I joined but I think I'm my only friend. I haven't spent much time networking on the venues other than Facebook. Tumblr, I joined last night and it looks like it's another blog. Nevertheless, as time goes by, I need to learn all of these networking things because they all hit different audiences. The more people who see our wares, the more sales we get. Now I need to learn how to convince this internet population to purchase items from Cajun Stitchery, whether custom orders or Etsy items. This morning we had an unexpected call from a neighbor inviting us to join them for coffee on their patio before it got too hot. We went and enjoyed their beautiful garden. We've gotten to where we trade plants. Our neighbor has ponds and his water lilies are getting ready to bloom. Ahhh, Spring. It's just such a delight to lose yourself in nature. Our lilies this year are remarkable and prolific. We all feel the cold winter was a shot in the arm for the plants. They just seem to come back with a vengence this year. It could also be that we were so ready for Spring after such a cold Winter. The good news is that so far the oil has still not landed on the shores of Florida. Prayers continue that our shores be spared. The bad news is that it may be in the Gulf Stream headed toward the Atlantic. I think we are over the stuffed grape leaves. They were delicious. I took the leftovers to my Wednesday night girls’ night and we ate more of them. The leftovers from Wednesday night went home with a friend of mine. We have more grape leaves in the freezer and the vines are full of even more. If anyone wants grape leaves, come on over. Although I loved the Greek sauce, everyone else said it was too garlicky and were not impressed with it. Maybe next time I’ll try my hand at making the tzazuki (no clue how to spell or pronounce it) sauce. Our neighbor made it to Pennsylvania and arrived safe and sound. We heard from her on Saturday but nothing since then. She is probably busy starting a new job and getting settled in a new apartment. Sure hope we hear from her soon. Good news! One of our new neighbors, across the street, surprised us with a homemade carrot cake this week. He said that his father taught all of the boys in his family to cook just in case they ever marry a woman like their mom, who doesn’t cook. I smiled. I blushed. I took the cake. I gave him carrots out of our garden, just in case he wants to make another one. As Mama would say, “En tout cas.” I marveled at how Mama could always find someone else to cook. I think God takes pity on us and provides these wonderful cooks. Nevertheless, I am thrilled at this outcome. We now have more new neighbors. A rental, a few doors down, that has been empty for awhile is now occupied. I understand that the occupant is the owner. The speculation in the neighborhood is that he is here to remodel or upgrade but we really don’t know. I wonder if he cooks? It’s time that we have a neighborhood gathering for the new neighbors. I’ll start working on that. The nail technician’s design has been done and delivered. The salon is called “Malachite” which is a green stone that has swirls of various shades of green. The design was a lady’s hand poised over a bottle of nail polish with the nail tech’s name “Reiko” off to one side. The hand is the green swirls. It does look odd to have a green hand, but it’s a cool design. George and I are still working on resolving our insomnia issues. I think we just have a lot on our minds. We will go to sleep and sleep for 2 or 4 hours and then we are awake for the night. By mid-afternoon we crash for a few hours. We keep trying to make ourselves stay awake until bedtime and that has worked on a few occasions, but most of the time, we get our second wind by then and we’re still awake until the wee hours of the morning. George got some over-the-counter sleeping pills. They seem to work for him but not for me. I’m making lots of cell phone holders to put on Etsy. If they don’t sell on Etsy, they will be offered for sale at the crafts festival in October. But I’m really trying to figure out what sells on Etsy. The Muwaa hand towel with the kissing lips has a lot of people looking at it but no takers. Of course, from what I’ve read, that gets people to our store and they will look around. I still need them to purchase something. No more totes. I say that, but you never know. What I do know is that I, personally, have more totes than I can use and I think my friends do, too. Totes were such a big deal and are necessary to take shopping but just how many totes can a person use or carry around with them? George, bless his heart, keeps a stash of totes in the back of his car for when he goes grocery shopping – then he forgets to take them out. Haha. Facebook is a wonderful networking thing. My friends tease me because I have so many friends on Facebook. Last count I had 1,099 friends. No. I do not know all of these people but I am getting the Cajun Stitchery name out there. And, we are getting some business from the Facebook friends. The inquirers that had messaged George about embroidery never ordered anything, at least, not yet. However, we have had a few people order from Facebook. This week we received another order from someone that I only know from Facebook. This order may turn out to be a series of orders because it is for a business. Woohoo!!!! "Marie," Boudreaux whispered to his wife late one night, "if I died, would you get married again?" "Mais, yeh, I guess," she replied. "Would you sleep in de same bed with him?" "Well, it's de only bed in de house, so I guess I'd have to." "Would you make love to him?" "Cher," Marie said patiently, "I guess, since he'd be my husband." "Would you give him my pickum-up truck?" "No, Boudreaux. I wouldn't never give him your pickum-up truck." she yawned, "Besides, he don't know how to drive a stick shift." With Memorial Day usually outdoor cooking follows along. This is a fun time for the family and neighborhood. Take the time to think about changing a few things to make your Memorial Day party more Eco-friendly. Below are just a few hits on how you can change a few things to make a difference. • Green Grilling- Use a solar powered grill for your grilling fun this Memorial Day. If you must grill with something other than solar power use a grill that burns natural gas as it is cleaner than charcoal. • Pre-Party Cleaning- Use natural cleaning products to clean your outside patio furniture. • Go Organic- Shop at a local farmer’s market for food ingredients. You can find great local produce and meat at your local farmer’s market. • Bio Dishes- Switch to biodegradable utensils, bowls, cups and plates. • Napkins- Use washable napkins to reduce paper waste. Taped shoulder-to-shoulder. Seamless collarette. Double-needle neck, sleeve and bottom hem. I was supposed to post yesterday but we were busy. And busy is a good thing. Have you gone to http://www.cajunstitchery.etsy.com/ lately? Please go look at the cell phone holders and let me know what you think. I think I need to get back in that kitsch kind of design mode. I do love my new cell phone holder and it's doing everything it is supposed to do, plus it looks pretty. I have a few more that I haven't put on etsy yet. Hopefully, I'll do that today. A few weeks back we tried to put the ball cap sash on Boudreaux and found that we were missing 2 screws. We called the manufacturer and they sent the screws. We didn't get back around to the ball cap sash again until this past Monday. The new screws were the wrong ones. We had to call back and have them deliver the correct screws. They came in last night. Hopefully, we can get to the ball cap sash today and finally start working on it. Keep your fingers crossed. George was learning a bit about digitizing and working in our digitizing program yesterday. I went to my Wednesday girls night and when I got home, he was still playing around in the program. I can't wait to see the designs he embroiders. Facebook is a wonderful thing. My girlfriends tease me because I have a lot of friends on Facebook. A lady contacted me earlier this week asking me to digitize the logo for her husband's business. She wants the logo on some polo shirts for his birthday next week. We did the digitizing and she loved it. That makes me feel wonderful because I'm still such a novice at digitizing, but I'm getting better. Practice makes perfect. We've had a few orders from people on Facebook that we would not have gotten otherwise. I think Facebook is a phenominal networking tool. Our new neighbor across the street stopped by yesterday with a homemade carrot cake. Turns out he loves to cook. Actually he said he loves to bake. That was a delicious carrot cake. I am truly blessed knowing people who love to cook, especially when I don't like to cook very often. We also have another new neighbor a few doors down that moved in earlier this week. Wonder if they like to cook? It's a thought. The broccoli and lettuce have seen better days in the garden. We need to pull them up and plant something else in their spot. The carrots and onions are being harvested now and the tomatoes and bell peppers are almost ready. The lillies and several of the flowers are blooming. I just love spring. We have been doing some designs for barbers and hairdressers lately -- for their smocks. We did one this week for a nail technician. It's a hand over a bottle of nail polish. The odd thing is that the hand is green. The shop is called Malachite's and is named after the stone, malachite, which is a stone with green swirls of varying shades. So, we were asked to make the hand in the design resemble the green swirls in the stone. The customer was very pleased. I'll be putting some new items on Etsy today, so don't miss them. Go to http://www.cajunstitchery.etsy.com/. The pelican and mermaid totes that were put on Etsy last week have brought several viewers. They really are beautiful totes. This past weekend I've been working on cell phone and iPhone holders. I think I have the pattern down now. It always seems that I am fumbling around in my purse trying to find my cell phone, even when it's ringing. Several years ago a friend gave me a pretty little cell phone holder. It had a handle that I could put around my purse handle for easy access. The problem was the cell phone would fall out of the holder and I'd be fumbling around in my purse, again. I decided, way back then, that I needed a holder that had a strap of some sort to hold the phone in the holder, plus the hook or strap that holds the holder onto my purse. It was one of those things I always told myself I would get around to doing. This weekend I finally did it. While perusing the Etsy site, I was trying to find out what size to make the holder because different cell phones are different sizes, then of course, there are the blackberries, iPhones and all sorts of gadgets. It appeared that 3 1/2" wide by 5" tall is more or less the norm. My cell phone just slipped around in that sized case. My cell phone is 2" by 4". I finally made a holder for my cell phone that is 3" by 4" and it's working just fine. I made a few others that are 3" by 5" or 4" by 5". They really turned out cute. At least, I think so. They have a strap to hold the phone in the pouch and a metal "D" ring to connect a lanyard, clip or whatever you like to hang on your belt or purse. All I have is my little cell phone. I do not have a blackberry or iPhone and there is plenty of room in the pouch for a drivers license, credit card or cash. One of the pouches includes an embroidered panda as an additional pocket to the pouch. The prices on Etsy seemed to be from $13 to $25. Some were more, I didn't see any that were less. I'm thinking about $15 for mine. Last night while I was making the little cell phone cases, I was playing around on the computer and found some videos on sewing at Expert Village. One series of videos was on becoming a fashion designer. Nope, I haven't changed directions. I was just playing around. But the lady said something that struck me. She relies a lot on things her grandmother tells her. The lady appeared young enough to be my daughter or granddaughter. She said that no matter what courses you take or where you take them, there will be techniques that you do not learn. You should be open to listening to others who sew. In this day and age of mass production, a lot of the finer details in clothing and items are omitted and haven't been taught for decades. In addition, different cultures incorporate different techniques in their sewing. You really need to listen to all of these people. Even if you don't use a particular technique, it's nice to know and someday that may be just the thing that you need to apply on your garment. Although a lot of the series were on beginning sewing, how to thread a machine, cut out a pattern, etc., there were tips along that way that were just invaluable. No one knows everything. The point of the game is to find out and apply as much as you can. At least, that's my perspective. This week we hope to finally get the cap sash on Boudreaux and start learning how to embroider ball caps. We've had a few requests for ball caps in the past and I just hate turning down business. The ball cap issue brings me to another subject: skin cancer. Several years ago George found a spot on his arm. It turned out to be a basal cell. It was removed and all was well, but George's doctor told him either don't go out into the sun or, if you do, wear a covering on all parts of your body. Ever since George has worn long pants, long sleeves and a cap or hat. One of our neighbors was over today and he has the same problem but his doctor told him not to worry about covering his body with clothing, just wear the highest spf lotion you can find. I haven't been a sun worshipper since I was a teenager. Even then, I didn't lay out in the sun much. If I got a tan, I got a tan. Otherwise, I did not. I live in Florida and I'm as white as a sheet most of the time. It's funny because in "olden days" the milk white skin was a sign of beauty; now it's a golden tan. Mostly, I just aim for comfort. That brings us to ball caps. It really is a good idea to cover your head in the sun. Aside from the risk of skin cancer is what the sun will do to your eyes. The last few times that I've been to the eye doctor, he's told me to make sure I wear sun glasses and then I get my prescription for progressive lenses -- which I love. The sun in Florida can certainly burn your eyes. So, be careful and wear a hat of some kind when you are in the sun. The good news is that so far the oil has still not landed on the shores of Florida. Prayers continue that our shores be spared. The going away party was a great success last Friday night. And everyone raved about the stuffed grape leaves. Apparently, grape leaves stuff with rice, ground beef and Cajun seasoning is very Greek. Who knew? Tomorrow night a few of the neighbors are coming over for more stuffed grape leaves. This time, however, we have the proper Greek dip/sauce made with cucumbers. One of our neighbors got the dip/sauce from a neighborhood Greek restaurant called the Hip Pocket. My neighbor headed to Pennsylvania on Wednesday. It was sad watching her leave but she’ll be back. She has to. She didn’t sell her house. Now we have a new neighbor next door who is the father of another neighbor. George and I decided to split the jobs that our neighbor handled. George is going to constantly complain to the authorities to keep the neighborhood in shape and safe and I am going to cook and entertain. I really don’t mind the entertaining part. We’ll see how the cooking part goes. My barber friend found a sale on smocks from a local uniform company, Bosso’s. He purchased 4 of the smocks and we did the approved embroidery design. I sent him pictures today. He’ll probably pick them up next week. I still need to create a design for the nail technician. I have suffered from insomnia all week. Actually, both of us have. It’s a two edged sword. I am certainly my most creative in the wee hours of the night, but by day I’m pretty cranky and tired. We are really trying hard to get back on schedule. I have put some of the things that I made during the late night hours on Etsy today and still have another item that needs to be photographed and placed on Etsy. Since I was mainly using the sample stitch-outs, I didn’t have to charge per 1,000 stitches and those items are going for a song on Etsy. Whether or not the people who look at the items will realize the deal is another thing entirely. There is a pelican scene embroidered on a tote with about 50,000 plus stitches. If ordered from Cajun Stitchery that design, alone, would cost $63.20. The tote is going for $25.00 on Etsy. A mermaid tote was placed on Etsy for $25.00 and the mermaid design has about 63,000 stitches. There are some good deals on our Etsy site. I created totes and can sleeves with other designs that were more specific to the person or group and would be meaningless to put on Etsy. Those items will go to specific individuals. One friend got the Junkanoo tote. Our Queen Doris XIX got the tote with the Queen Doris XIX on one side and the King Nerius XIX design on the other side. We still have a lot of samples remaining that I hope to incorporate into some kind of a creation. If they don’t sell on Etsy, then they are going to the craft festival in October on the beach. There was this Hell's Angel riding down the road on his motorcycle last winter. He was wearing a leather jacket that had a broken zipper. He finally stopped the bike and thought to himself, "Man, I can't drive anymore with the cold air hitting me in my chest." So he decided to put the coat on backwards to block the air from hitting him. He continued driving and came around a bend in the road, lost control and wrecked, coincidentally, right in front of Boudreaux's house. Boudreaux happened to see what happened, and called the State Police to report the accident. The Trooper on the phone asked him, "Is the guy showing any sign of life?" "Well," Boudreaux told him, "He was until I turned his head around the right way!" Carry a refillable water bottle instead of buying bottled water. If you drink from the tap (which is the most ecologically-friendly option), try keeping a pitcher of water in the fridge. That way, not only do you get nice cold water to drink, you ensure that every drop goes into you, instead of down the drain in the sink. 3.8 oz 100% cotton 50 single mini 2X1 rib. V-neck racerback tank with thin delicate straps. I'm still working on turning some of the sample stitch-outs into viable products to be sold or used as lagniappes. Since the Junkanoo logo would only be of interest to the specific krewe, I'm not selling those. Rather, I'm using those as lagniappes for when any of the krewe orders something. In fact, we finished another set of 5 red napkins with the white poinsettia and "Ballew". She will get the bigger Junkanoo tote bag with the logo on both sides of the bag. The other Junkanoo bag is smaller than the first and has the logo on one side. There is a slight issue with that tote, I accidentally cut off part of the wordings. Oops! It still looks pretty cool though. Remember the beautiful pelican that George put on the back of his jacket. We have the sample stitch out for that design, which I made into a small bag, complete with a magnetic snap. The bag will be placed on Etsy to be sold. The design alone would cost around $50.00 to stitch. It's an odd shaped bag, 4" wide, 2" deep, and 10 1/2" tall. It almost looks like a wine bag. There are occasions where I like to use a small bag but at the same time I have some essentials that I need to take with me, one of them is my wallet. I have a pretty new wallet that is a little bit longer than a dollar bill. It snaps closed with a hook mechanism. I cannot use it in my other small bags because they are too short. This pelican bag would hold my wallet, as well as cell phone with room for more. The sample stitch outs for King Nerius XIX and Queen Doris XIX are pretty specific. I took those two stitch outs and made one tote bag that I plan on presenting to Queen Doris XIX. All of the bags are fully lined. Do you remember the drop dead, gorgeous mermaid that George stitched out earlier this year? The one in all of the purples and greens. I had to do something with that sample, so I made a tote. I didn't have the matching olive green fabric that the design was stitched on, so I used a purple fabric and made some nice purple handles. The tote is fully lined in the purple fabric. I think it really turned out beautiful. This tote will be sold on Etsy. The barber smock arrived. In fact, the customer brought over 4 smocks. He wanted us to embroider the design on the burgandy smock and then he will let us know if he wants us to go forward on the other smocks. We finished the burgandy smock and am awaiting further orders. If he agrees to have the design on the other smocks, I will have to discuss colors with him, since the lighter colors will wash away the design in the colors that he requested. When I run across a small sample stitch out, I've learned to make soda can sleeves, like this one. I don't think I touched the embroidery machine this weekend. Can you believe that? Our neighbor is moving and I want to spend as much time with her as I can before she leaves and travels up north to Pennsylvania. We had the going away party Friday night which was a blast. It was held outside in our gardens. Saturday I did some computer work and piddled around the house recouperating from the night before. We had enough leftover food to feed an army. In fact, we did get Gulf shrimp from Joe Patti's for the Friday night extravaganza and contrary to rumors, the prices had not gone up. After dinner George and I decided to have a glass of wine on the deck. We brought the cd player outside and ended up dancing around the deck. It was a beautiful evening and we enjoyed ourselves. Our neighbor had gone kayaking and was in a walk of some sort for some worthy cause and we could hear her and her friends enjoying themselves outside, as well. It really was a beautiful evening. George and I ended up watching movies. I ended up going to bed around 5 or 6 a.m.
On Sunday, I peeled the leftover shrimp and made a shrimp dip. We sat outside with our neighbor and ate peeled shrimp and cocktail sauce, chips and shrimp dip, and leftover stuffed grape leaves. Oh, and of course, the wine. Despite the citronella torches, the mosquitoes were still out in droves, so we ended up inside and played a game of Scrabble. By 8:00 p.m. we were all exhausted and bid each other a good night. I was in bed by 10:00 and slept soundly. So, here we are. Monday morning and back to work. We are starting out the day working on a couple of designs. First, we have an order for the Poinsettia/Ballew napkins that we need to fill. Then, we are going to stitch out the barber design that we created last week. The customer is still trying to find a burgandy smock to place the design. We have to create another design this week for a nail technician. She does manicures, pedicures and gives a wonderful foot bath. Then I need to pay more attention to Etsy and get more stuff on there. I'm trying to take some of the sample stitch-outs that we do and turned them into projects. I took two of the large Junkanoo stitch-outs and created a really cute tote. Some of the smaller stitch-outs have been turned into can sleeves. I just hate throwing those stitch-outs away. The good news is that so far the oil has not landed on the shores of Florida. The bad news is that tar balls are landing on the shore in Alabama. This week had been a week of learning about oil spills and the politics involved. Prayers are going out that our shores be spared. The time that I have spent working this week was without the help of George. George spent the week scraping off our popcorn ceilings, smoothing them out, and painting them. My ceilings are beautiful. Neither of us likes the popcorn ceiling. Over time dust, smoke and filth accumulated on those ceilings. We couldn’t paint or clean it because of those popcorn pieces of paint. The ceilings were nasty looking. We now only have one room in the house that still has the popcorn ceiling and that’s the study. We’ll do that some other time. The study is the catch all room in the house. It’s just too much to deal with right now. After my blessed husband provided me with new ceilings, and taking a significant amount of Advil because his neck hurt from look up at the ceilings, he proceeded to clean the house spotless, including the yard, for a going away party that we gave last night for one of our neighbors. Last week the neighborhood got together for a birthday party. We began talking about our grape vines. I’ve heard of using grape leaves in cooking and was wondering if anyone wanted any grape leaves and what would you do with them. Apparently, there is one thing you can do with grape leaves and that is for stuffed grape leaves. I had looked on the internet and saw some recipes and directions. Our grape vines are so lush that George worried that the grapes weren’t getting enough sun. So, he wanted to trim the leaves. I didn’t want to throw those leaves away because I knew you could use them in cooking. I read that you can take clean, dry leaves and simply stack them and put them in plastic bags in the freezer, squeezing out all of the air that you can. That was done. We still had a ton of leaves. After extensive discussions with our neighbors and reading many articles and recipes about stuffed grape leaves, we did it. George and I had a little assembly line going. As soon as they were cooked, I had to try them out. Not bad; not bad at all. Of course, my stuffed grape leaves contained Cajun seasoning. We never counted how many we made but I would say in the area of 100. I had some. George had some. The remainder went into the refrigerator. The recipes said that you can serve the hot or cold. Wednesday night I was telling the girls at our Wednesday night group about the stuffed grape leaves. They were very impressed and instructed me to save the remainder in the frig and serve cold on a platter for my party Friday night. I did. In fact, I used a gold charger, with a clear glass platter, arranged the stuffed grape leaves (there were enough to fill the platter) and put sprigs of the parsley from our garden on top. Those stuffed grape leaves were just about gone by the end of the evening. Who would believe that a little Cajun girl who can’t, or doesn’t like to, cook could make a Greek dish that everyone loved? Of course, the problem is how many stuffed grape leaves can you eat? I ask because the garden is so lush that we will probably have to trim more leaves soon. If you want grape leaves, I’ve got ‘em. A friend of mine recently became a barber and asked me to create a design for his smock. He didn’t like any of the stock designs that I offered. I finally had to digitize what he had in his mind. I’m still learning to digitize. I’m at a point where I can do some simple designs. He loved my digitized design and is going to get a smock for me to embroider. Once I digitized the barber design, I started thinking about a Black Tide design. I digitized the design. A photo is attached of the stitched out design on a red woven fabric. There are areas in the design when stitched that are open. They are where two colors meet. This doesn’t show in the design picture, only when stitched out. I have some ideas of how to correct this but everyone who has seen it, likes the spaces. They remind me of rivers. I may just leave them in. One of my mermaid friends has decided to do sewing in her home. If you need sewing done or alterations, call me and I’ll give you her name and phone number. I do vouch for her. She is one of the co-chairs of our costume committee and does beautiful work. We did win the Grand Marshall’s award this past Mardi Gras. She is a very talented seamstress. In fact, one friend said she wants to take her wedding dress and have a pillowcase made from it. Then she wants her anniversary date embroidered on the pillowcase. My friend would do the sewing and I would do the embroidery. Most of the week I’ve been isolated in the embroidery room because George was scraping and painting the ceilings where I’m usually located during the day. It was kind of nice. I was able to work on designs and immediately take them to Boudreaux. We did embroider a towel for a customer. The other night I couldn’t sleep. I ended up sitting in front of my sewing machine with all of those practice stitch-outs around me, wondering what to do with them. One of my neighbor’s sons has a logging business. We created the company logo and have stitched it out on several shirts and other things. There were two practice stitch-outs and I just hate to throw that stuff away. I made 2 can sleeves, like koozies but without the bottom. The stabilizer added the extra bulk and absorbency. They are adorable. My neighbor loves them. I also had an extra stitch-out of the Cajun Stitchery design and made myself a can sleeve. Once I finished the can sleeves, I headed toward all of those Junkanoo stitch-outs. We have a bunch of those. I made the prettiest, completely lined, tote bag with green grosgrain ribbon for the carrying straps. I remember doing the Junkanoo jackets. Those designs had, I believe, 45,000 stitches in them. If I sold the bag, the stitching alone would be $90, and that’s with a discount. I need to make more things out of those left over stitch-outs. Maybe I’ll put some on Etsy. There are some beautiful mermaids stitched outs with no place to go. Hmmmm. We post periodically throughout the week. Become a “friend” on the blog and never miss a post. Boudreaux & Thibodeaux were fishing one day when Boudreaux pulled out a cigar. Finding he had no matches, he asked Thibodeaux for a light. "Shure, I got a lighter," he replied. Then reaching into his tackle box, he pulled out a Bic lighter 10 inches long. "Jiminy Cricket!" exclaimed Boudreaux, taking the huge Bic lighter in his hands. "Where did yew git dat monster??" "Well," replied Thibodeaux, "I got it from my Genie. ""You gots a genie in dat tackle box?" Boudreaux asked. "Yep, I shure got one. It's right here in my tackle box," says Thibodeaux. "Could I see him?" So Thibodeaux opens his tackle box and sure enough, out pops the genie.Addressing the genie, Boudreaux says, "Hey dere! I'm a good friend of your Master, will yew grant me one wish?" "Yes, I will," says the genie.So Boudreaux asks the genie for a million bucks. The genie disappears back into the tackle box leaving Boudreaux sitting there, waiting for his million bucks.Shortly, the sky darkens and is soon filled with the sound of a million ducks ... flying overhead.Over the roar of the million ducks Boudreaux yells at Thiboduaux. "Jumpin' Jimminy Crickets! I axed for a million bucks, not a million ducks! "Thibodeaux answers, "Yup, I forgot to tell yew dat genie is hard of hearing. Do yew really tink I axed for a 10-inch Bic?" I’m repeating the eco tip from last week since this issue has arisen in our current preparations for the Gulf oil slick. There is a website http://www.matteroftrust.org/ that collects the hair from salons. Any major oil spill causes great environmental damage. The oil spill that took place on the San Francisco Bay in 2007 resulted in spillage of 58,000 gallons of bunker fuel from the container ship Cosco Busan. But what makes the San Francisco Oil Spill unusual, is the oil spill cleanup technique that was adopted. A group of volunteers cleaned San Francisco’s beaches using unconventional products, namely human hair and mushrooms. Though unconventional, it is an organic and eco-friendly way of cleaning up oil spills. You must be wondering where mushrooms come into the picture in this whole process. Oyster mushrooms have the power to convert toxic oil to compost. In the San Francisco oil spill, once the hair mats had soaked up the oil, oyster mushrooms were layered between these mats. In about 12 weeks, these mushrooms not only absorbed but turned these oil-soaked mats into non-toxic compost. The success of using hair and mushrooms in the San Francisco oil spill cleanup calls for more such innovative, cost-effective, and eco-friendly techniques of cleaning oil spills. One such eco-friendly technique that has proved to be effective in oil spill cleanup is bioremediation technology. This week’s sale will be the tee shirt (below) with the Black Tide 2010 design embroidered for $25.00, plus tax. For each order $5.00 will be donated to the Wildlife Sanctuary of Northwest Florida. The Black Tide 2010 design is approximately 5” x 5”. Colors: Ash, athletic heather, azalea, azure, banana, black, burgundy, chocolate, coral, cornflower, denim, Dakota slate, forest green, genoa teal, gold, jade, Kelly, khaki, kiwi, lavender, light blue, light mint, natural, j. navy, orange poppy, orange, pacific blue, pink, purple, royal blue, sagestone, texas orange, true red, white, yellow. 5.6 oz. 100% cotton (athletic heather is 90% cotton/10% polyester). Seamless rib collar. Shoulder-to-shoulder taping. Double-needle sleeve & bottom hem. I missed posting on Monday. We've just been engulfed (no pun intended) with news of the oil spill, cleaning up beaches, and taking care of anything we can pre-landfall. Then there are all of the issues about BP. We started out questioning the integrity of BP to handle the cleanup. Yes, we are skeptical. We've been through Hurricane Ivan and know how underhanded big business can be. We'll see what happens. Back to embroidery. 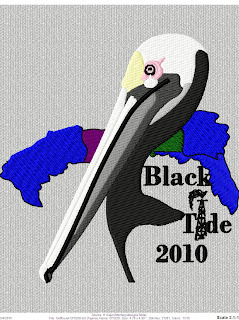 With all of the concern over the oil spill, and knowing that I need to practice digitizing, I created the Black Tide 2010 design. As you know, I'm just learning digitizing. I digitized the pelican from a photograph that we had taken from the local Wildlife Sanctuary. Not very life like, but I was pleased that it turned out this well. I put the design on Facebook and only had one response from a lady who did not like it. I asked why but never received a reply. I don't know if she didn't like the digitizing, the theme, or what. If the design brought sad emotions and that's why she didn't like it. That is a good thing. It means that the artwork pulled those emotions. If she felt the design was simply ugly and not a good design, that is a totally different thing and I would need to go back to the drawing board and learn more on art and digitizing. We were contacted by a gentleman who is a barber and wants his name on the front of his smock and a design on the back. 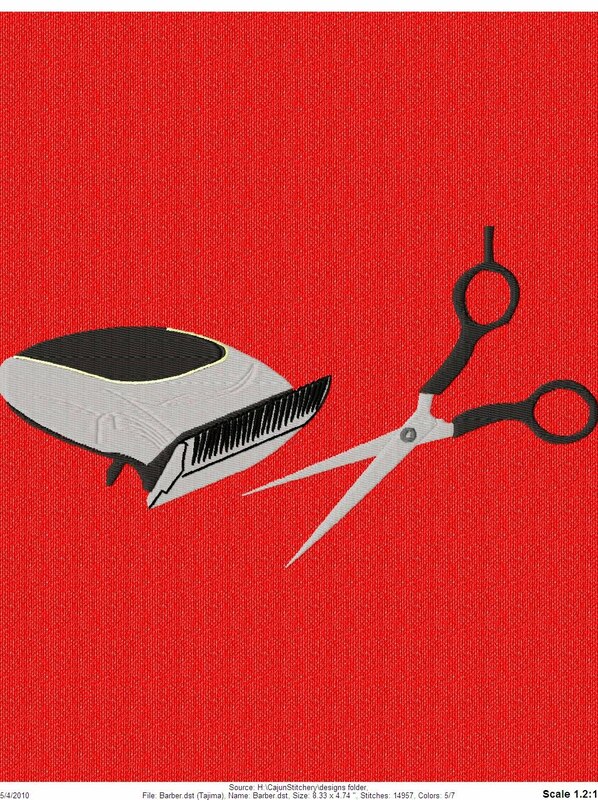 He wanted the design to be electric clippers and a pair of scissors and sent photographs of what he wanted. I spent most of Monday going through stock designs putting together the design for him. He didn't like it. He said it looked too cartoonish and again sent the pictures. We have no stock designs for what he wanted, so I digitized it. He loved it. He's going to purchase a new smock and bring it to me for the embroidery. Last week we had an order for a set of pillowcases. The hem on the pillowcases is 3" and the customer requested an "L" in the English font, 3" high. She had to settle on 2.5" because 3" on the hem would have gone off the bottom and looked bad. Sure. Ask me how I know. Because we did one and ended up scrapping it. Nevertheless, the pillowcases turned out lovely. All of that compost and fertilizer that we put in the garden really paid off. The garden is the prettiest one since we've been gardening. It's so lush. I love playing in the garden!